Thursday, November 9, 2017 – Midnight Oil cut short their show at Melbourne’s Sidney Myer Music Bowl last night after lead guitarist guitarist Jim Moginie, 61, tripped and fell off stage at the end of the main set. Singer Peter Garrett, returning to the stage for the encore, apologised that they could only perform one song acoustically because Moginie had fallen and injured himself. Garrett explained that the guitarist was alright but was resting. The Age reports that Moginie was escorted off-stage and treated in an ambulance. “Sorry for the short encore but Jim took a spill and hurt his leg at end of main set. Wishing him a quick recovery,” the Oils wrote on Twitter. 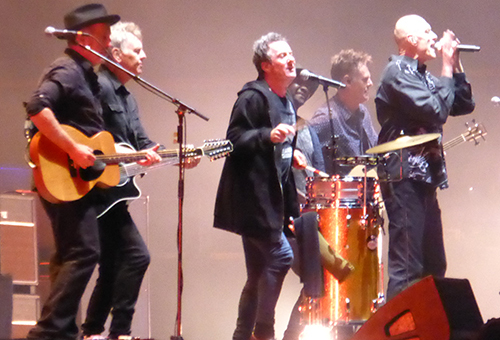 The band are due to return to the Music Bowl next week following gigs in Sydney and Wollongong.